37.5C. This number might make some working parents anxious. The temperature is the borderline for a nursery school may refuse to babysit a child. It is difficult for many working parents to leave work early or take a day off on short notice to care for their children. This drama focuses on a nursery teacher, Momoko, who takes care of sick children when parents cannot be with them. Misako Renbutsu plays a leading role for the first time in a commercial broadcaster's drama. Featuring problems that working parents often face, this story portrays Momoko's development as a person and the relationships she builds with those around her. Momoko is a novice child care employee at a visiting sick child care service called "Little Snow". The story starts with Momoko visiting her first client in a house that, she is shocked to find, is utterly filthy. Although she tidies up with the best of intentions, her client later complains to the company. Her boss, Yanagi (Naohito Fujiki) - much angered by the complaint - gives Momoko a warning against any kind of intervention in clients' family issues. 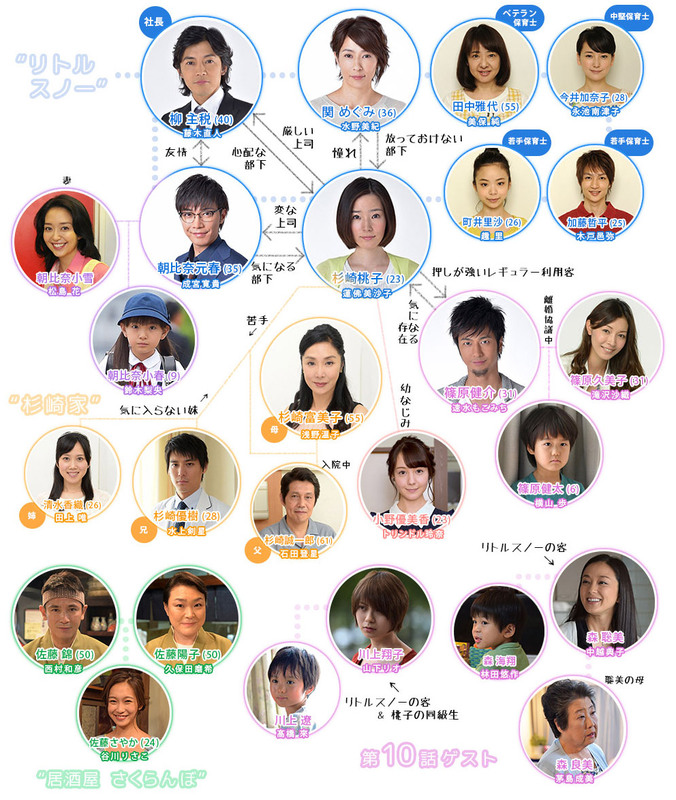 The co-owner of the company, Asahina (Hiroki Narimiya), on the other hand, intercedes to offer Momoko his support, and a few days later, Momoko is sent to a regular client's house, Shinohara (Mokomichi Hayami). Surprisingly good. I'm not a kid person so I thought that I wouldn't like it very much but I did. Koharu chan was so cute! Ok for a light watch, but nothing special. Characters are rather over-the-top and has some cheesy speeches. What starts as quite the cute drama has an opposite dark side and subplot. Interesting drama that is a bit preachy but thoughtful! Nice and heartwarming family drama.